Becca Thorne Illustration: New Baby! Not mine! My old school friends Sam and Rex had their first baby last month (much as I tried to convince Sam to give birth on my birthday, it actually happened two days later by caesarean section- babies are so stubborn). 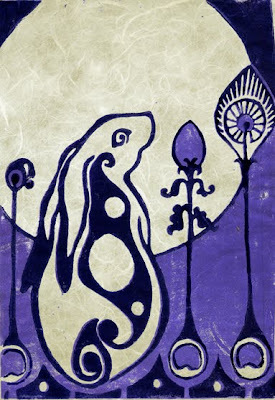 The new one's name is Esme Rose, and I made her and her exhausted parents this hare and moon card to say congratulations, and welcome to the world.